ALWAYS WEAR A HELMET, EYE PROTECTION AND PROTECTIVE CLOTHING. NEVER RIDE UNDER THE INFLUENCE OF DRUGS OR ALCOHOL, AND NEVER USE THE STREET AS A RACETRACK. OBEY THE LAW AND READ THE OWNER’S MANUAL THOROUGHLY. For rider training information or to locate a rider training course near you, call the Motorcycle Safety Foundation at 800-446-9227. The 670cc liquid-cooled parallel-twin engine underneath the NM4’s bodywork is perfectly matched for the kind of riding you’ll be doing. Quiet, smooth, powerful, its power delivery is perfect for around-town, and it’s strong enough to carry you and a passenger in comfort on the open road too. The NM4’s front and rear are stylishly integrated with bright, powerful LEDs. They offer excellent visibility, are long lasting and add to the NM4’s dramatic presence. The NM4’s super comfortable seat is the lowest in our entire lineup. It’s a low 25.6 inches so you always feel in control. You never know what the future may bring. The NM4’s front utility compartment has room to hold all the accessories for your lifestyle, along with a 12-volt accessory socket to power your phone or GPS. With looks designed to blow minds, the NM4 wields a stylish front end, and its fluid lines meld into a low, sculpted tail with dual 16-liter integrated storage compartments. The NM4’s adjustable backrest makes sure you’ll find your perfect riding posture. Riding tandem? Just flip down the backrest and you’re good to go. Shift with the push of a button, or select the NM4’s automatic mode and the bike will shift itself. Our DCT has been a huge hit, and once you ride an NM4 with DCT, you'll see why. 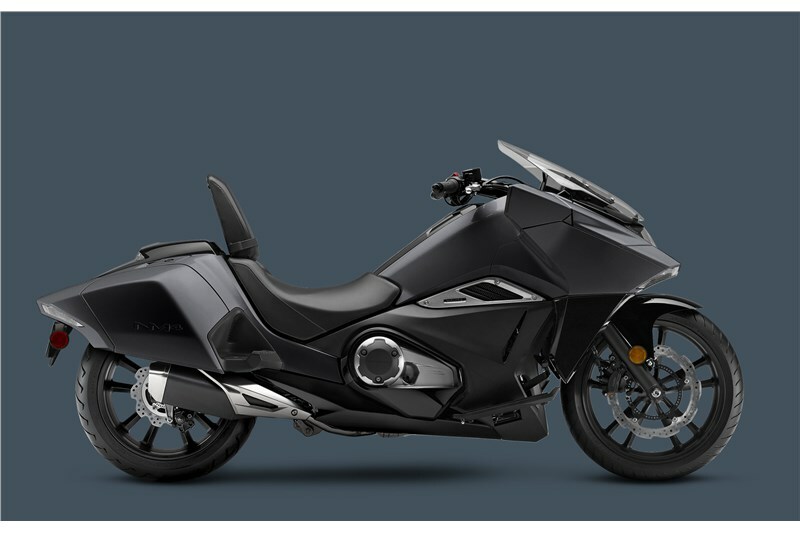 Unique in Honda’s motorcycle lineup, the NM4’s LED instrumentation does way more than just give you information. It lets you tailor what color your display is, with the push of a button. No other bike out there gives you this kind of choice.